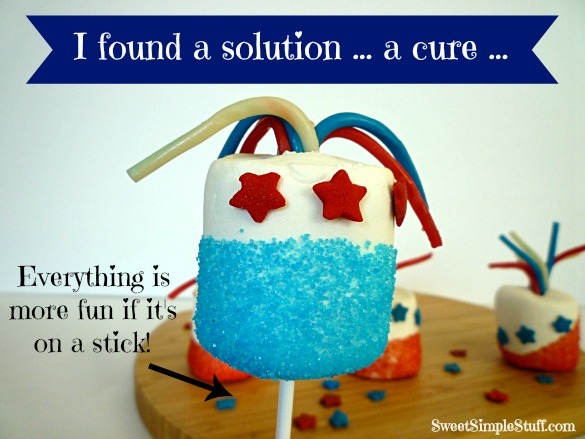 I am not perfect … my Firecracker Pops are not perfect and I’m OK with that! and challenged me to make something with it! I accepted this challenge and drove off to Walgreens to buy the red, white and blue Twizzlers! I had an idea … a plan … the fun of Twizzlers is pulling them apart … don’t you agree? 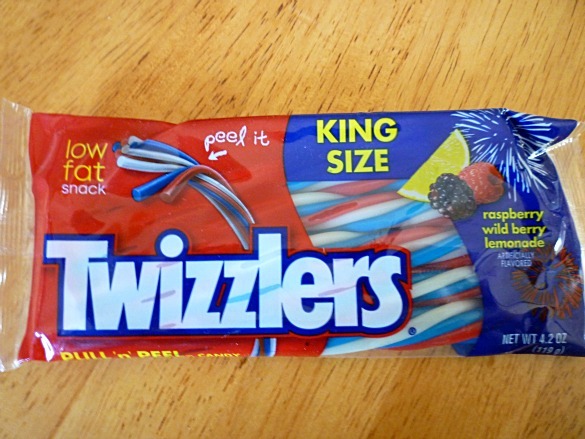 Twizzlers will work great as the top of firecrackers … right? Jumbo marshmallows will make great firecrackers … right? Then I remembered what my friend, Dinaz, says “It’s only sugar”. Does it need to be perfect? I don’t think so. Does it need to be fun? Absolutely!!! 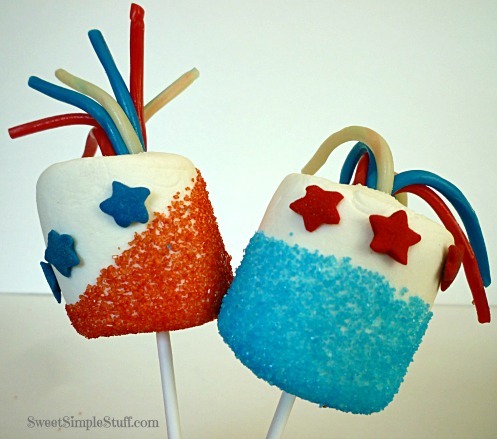 I say these firecrackers are fun, sweet, a little wonky, kind of goofy and they make me smile! Dip the serrated knife in water and insert it into the center of the marshmallow almost to the other end. 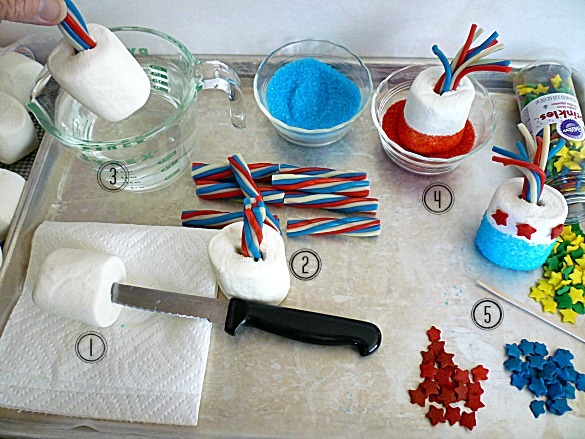 Cut Twizzlers in half and insert a half into the marshmallow. Water acts as glue for the sugar to stick to the marshmallow. Dip the marshmallow in the water … getting it wet where you want to apply the sugar. Use a paper towel to dry off excess water. 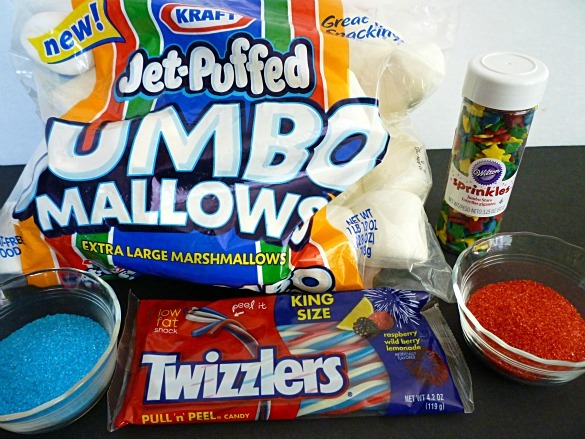 Dip the marshmallow into the colored sugar. Separate the strands of the Twizzler. Use the toothpick to add a drop of water on the marshmallow to attach stars. Dip tip of lollipop stick in water and insert into bottom of marshmallow … take care to avoid the Twizzler! Brenda, you exceeded my expectations by simply separating the Twizzler strands, something which I could not accomplish. Oh, this is fun… I’m keeping my eyes open for the next challenge. Meantime, I’m learning to think outside the box, thanks to you. Kathleen, you are too kind 🙂 I live outside the box … is that good … or not? They may not be perfect, but they are perfectly fun! 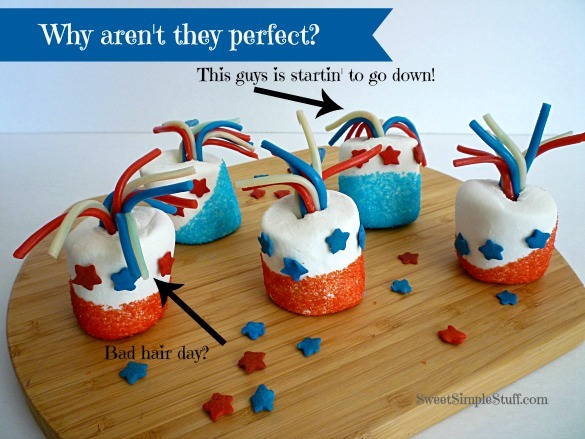 These would be great for kids to make for the 4th. Another must do for me. Too cute. Thank you Mary 😉 I hope you enjoy! I think they are perfectly CUTE!! I want to do this for our July picnic. They kids can decorate all by themselves! I Love this idea! Thanks for sharing!! RWB Twizzlers – who knew such a thing existed?. I’ve been thinking what to use to resemble the sparkle at the top of a firecracker. I’ve discovered that Target, CVS and now (apparently) Walgreens are a good source for holiday inspired “bling”. I’ve also realized that when you see something you’ll need – buy it now as stores don’t stock a lot of things they’re not sure will sell. So…..off to Walgreens I go. Having never worked with Twizzlers before (ignorance is bliss) – I’m thinking maybe I’ll unravel them, but not all the way down to the base in an attempt to make them stand upright while still spraying out at the top. Kathleen (above) mentioned it can be tricky to separate the strands of a Twizzler. Any hints if they just don’t wanna come apart? Thanks for such a “sparkly” 4th of July idea. We owe this discovery to Kathleen! Walgreens is now on my list … don’t forget dollar stores! Regarding the separating of Twizzlers … my Twizzlers were fresh and soft, separated easily, but I had to watch cutting them with my nails (my nails aren’t that long), I used my finger tips to get it started and pulled slowly. UPDATE: Walgreens (candy section) has the Pull & Peal RW&B Twizzlers $2.88. Walmart has them (same size bag) near cash registers for $1.88. Thank you for that info 🙂 I always love a bargain! What a fun treat! Love how they look like little firecrackers/fireworks for 4th of July. All the kids will enjoy this! Thank you Bobbi 😉 I’ll watch some fireworks for you … we are not allowed to shoot them off. Love love love these!!! My kiddos would just think these were the best!! Because I love all your yummy ideas I have nominated you for the Liebster Award. To accept go to http://economicalmommy.wordpress.com/ to follow the instructions for acceptance.